surrounded by new Travertine Marble Patio fully screened and enclosed! A/C, Water Heater and Electric Panel is less than 1 year old! Gorgeous plantation shutters and stainless steel kitchen inside the home also. This home is fully fenced and great for kids to play outside! Welcome large pets, you have plenty of room too!! There are 3 docks in the back that can fit up to 2 Jet skis and 1 Boat so you can enjoy the 30 mile long canal for water skiing and fishing. 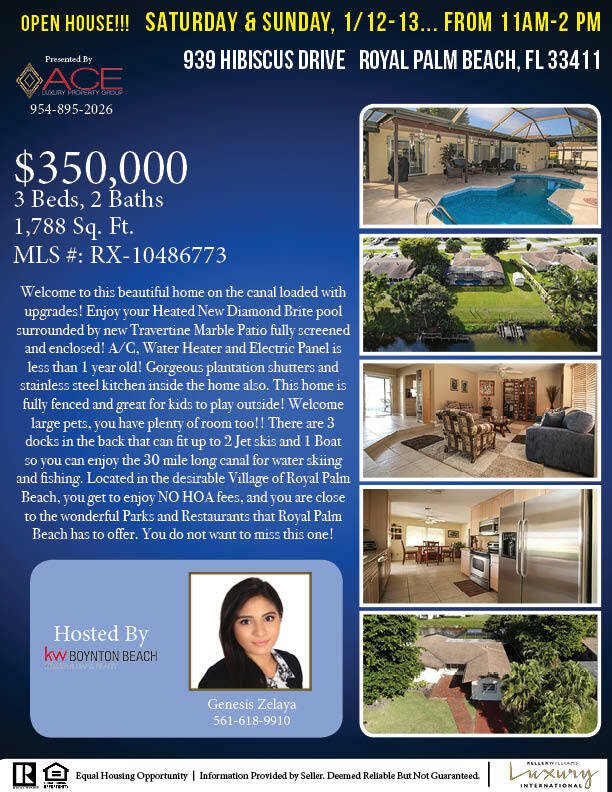 Located in the desirable Village of Royal Palm Beach, you get to enjoy NO HOA fees, and you are close to the wonderful Parks and Restaurants that Royal Palm Beach has to offer. Click HERE to see complete property info!